The Alfa Romeo 4C’s almost-1750cc engine is an absolutely amazing motor, wild and loud and immediate. But thanks to the tricks of modern turbocharging, it doesn’t exactly offer the fuel economy you’d expect. And I figured all of this out in the middle of nowhere, with 30 miles of canyon road between me and the next gas station. 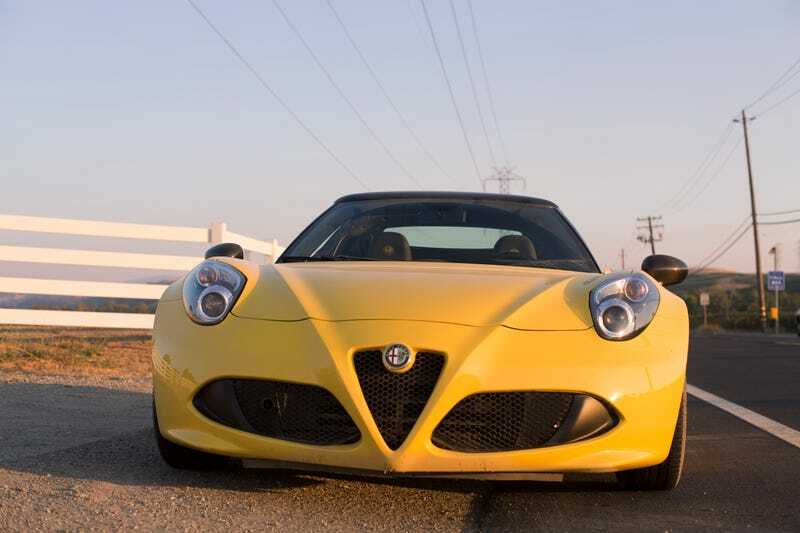 Despite having such a teensy engine, the Alfa Romeo 4C compels you to waste gas. If you’re driving at a low speed, say, 60 miles an hour, you can wiggle your foot on the gas and hear the turbo spool up right behind you. Stay on it for a moment and sharply lift off the pedal. The blow-off valve will dump out all the excess boost in this super wonderful chatter. It sounds like a squirrel getting thrown into a jet engine. It rules. So you end up spending most of your time on the highway driving from 3,000-3,100 rpm over and over and over again. Not great for fuel economy. When you find a twisty backroad, the 4C only encourages you to waste even more gas. It’s a spikey car. It can be wonderfully smooth an rhythmic in third gear bends, but it mostly wants to hurl itself into corners. Front tires squealing, exhaust farting, steering wheel fighting back in your hands. There’s a way that it sort of squats down as you power away that feels like the car is punching the road. This was my experience yesterday when I took the very scenic route from the Monterey coast up and into the flat ag land around Sacramento. The Alfa has no GPS, so I bought a map at a gas station, looked for the longest squiggliest line, and found myself on Del Puerto Canyon Road. Above is a view of the road on Google Maps. This link should take you there. I don’t know if I’ve ever been on a road quite like it. You get to it going north on 5, which takes you through the very armpit of California, hot and dried. Below is a picture of it at something hovering around 108 degrees fahrenheit. Get off at Patterson, loop under 5, and make the quick right onto Del Puerto Canyon Road. Well, you should get gas before you turn to the canyon drive, which I did not. This will become quickly apparent to you, as it did to me, when I saw the sign that read curves for the next 22 miles. It’s exactly the kind of road perfectly tailored for the Alfa. Wide and well sighted for a mile, one-lane and blind for the next. Smooth in some sections, cambered and rough thereafter. In parts you’re wide out in the foothills, in others you’re pulled tight to steep walls in the canyon. You can hear stones ping against the carbon fiber floor every time I take an inside turn by the rocks. The chassis of the car is so communicative, the steering so active, and the engine so fiery that I just push and push and push. Finally I hit a T in the road. I take the right going north towards the Sacramento River delta and Livermore. I spot two signs. One says there’s no gas behind me for 25 miles. The other says there’s no gas ahead of me for another 31. That’s is a problem, because I have a third of a tank left and the car is telling me I only have 40 miles of range. I learn two things from this information — the first is that the 4C’s mileage must have been barely into the double digits for the canyon road. The second is that I’m going to need to be incredibly fuel efficient if I’m going to make it out of this canyon road to a gas station in Livermore. So I put the car back in its normal mode out of its sporty setting. I shift up in the gears as quickly as possible. I start driving with my foot smooth on the accelerator, trying to keep the revs as even and as low as possible. I let the car blend and glide through the corners, as light as I can on the throttle. Long downhill sweepers leading from the mountains down to the river floor below start reading instant mpg numbers in the 30s, 40s, 60s, 70s. I roll into Livermore with two gallons left in the tank, a combined total mileage for the trip thus far at around 24 miles to the gallon. That includes another canyon road or two, and a good bit of highway cruising as well. This perfectly highlights the nature of modern turbocharging. Five or 10 years ago, carmakers started to become obsessed with a term called ‘downsizing.’ It meant to make your engines smaller and cleaner and more economical. Increasingly tough fuel economy standards put pressure on carmakers to produce more fuel efficient cars, and the recession turned buyers towards more miserly cars as well. The impetus to downsize was clear. Where carmakers turned things around, though, was that they didn’t want to sacrifice any performance for their reduction in engine size. That meant that engines had to become more efficient, and that meant turbocharging. With turbochargers, carmakers figured they could get a small engine to put out the same amount of power as a larger engine. Companies like Ford and Hyundai talked up how their turbo four cylinders had the power of a six while returning four cylinder economy. This worked perfectly well in the tests manufacturers and regulatory agencies performed. These tests kept revs low and engines out of boost, so they returned great economy. They used particular cycles that had been in place for years but didn’t really reflect how anyone actually drives anymore. You can read a full article about how and why it all works right here. So what happened out in the real world was a different story. When people wanted speed out of their downsized engines, they really had to put their foot in it. That engaged the turbo, and the turbo burns tons of gas. It forces more fuel and air into the cylinder, so you do get more power, but it’s not with the same economy as normal. And that’s exactly what happened to me on Del Puerto Canyon Road. When I wanted the full 240 horsepower the Alfa’s engine advertised, I had to rev the thing hard and run at lots of boost. And that meant the mileage was absolutely horrible. This little four cylinder was sucking gas like a muscle car. However, when I did need the thing to come through for me and sip gas, I did indeed have that option. I just had to drive like a total grandma. I cannot fault Alfa Romeo for giving the 4C this little but heavily turbocharged engine. It plays to the test, so Alfa can adhere to their regulatory standards. It’s small and it’s light, so the car can stay compact and agile. And it also makes really awesome whooshey noises when you want it to. Just don’t think it’s always a fuel miser like it advertises.